Tea Party activists have made history in recent years and our movement will continue to shape the nation’s future. To fully promote our conservative principles, the True Tea Party wishes to explain our endorsement in the presidential race. Tea Party groups revere the Constitution and only one candidate has pledged to fully support Americans’ Constitutional rights. That candidate is Barack Obama. The president favors abortion rights and permitting both straight and gay couples to marry, an affirmation of family values and the 14th Amendment. Mitt Romney opposes both choice and marriage equality. Illegal immigration concerns Tea Party groups and President Obama deported a record number of undocumented aliens three years in a row, more than a million in all. The president also strengthened border security, causing illegal crossings to plummet. Romney’s plan for “self-deportation” can’t compete. Real Americans love guns and President Obama’s election set off a flurry of gun sales, thereby promoting gun ownership. On the other hand, Romney trampled on the Second Amendment when he signed a gun control measure as governor of Massachusetts. National security requires a strong military and President Obama bolstered our armed forces by signing the repeal of the “Don’t ask, don’t tell” ban on homosexuals. He killed Osama bin Laden, won the war in Iraq and he’s leading us to victory in Afghanistan. Romney dodged the Vietnam War draft using academic and religious deferrals. Promoting limited government, President Obama signed the Budget Control Act of 2011 which cuts government spending by $917 billion. In Massachusetts, Romney increased spending by 24 percent. No issue obsesses Tea Party activists more than taxes, and here again, there’s no comparison. As one of his first official acts, President Obama lowered taxes on 95 percent of families. He cut 18 different taxes on small businesses. The president’s American Recovery and Reinvestment Act alone reduced taxes by $288 billion and Obama extended all Bush-era tax cuts for a $615 billion savings. In Massachusetts, Romney refused to sign an anti-tax pledge while running for governor, and later raised taxes on gas, sales, property, capital gains and business. For years, true conservatives yearned for health care reform to get uninsured freeloaders off our backs and out of our wallets. ObamaCare achieved that and will lower government costs by more than $1 trillion over the next 20 years. Unelected judges were the ones who called the law’s uninsured penalties a tax and the best way to stop this kind of judicial activism is to let President Obama appoint more anti-tax justices to the courts. 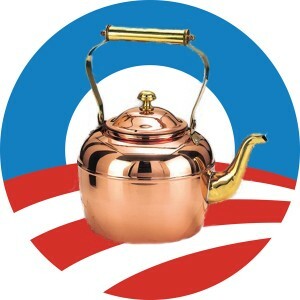 To conclude, Barack Obama clearly exemplifies Tea Party principles better than his opponent. In addition, he makes liberals mad by being so moderate, increases ratings of Fox News and helps Sarah Palin sell enough books to blanket Alaska. Besides, Romney’s father was born in Mexico and he hasn’t released his long-form birth certificate. Therefore we’re proud to announce that Barack Obama has earned the endorsement of the True Tea Party (that’s me, my wife and our two dogs).